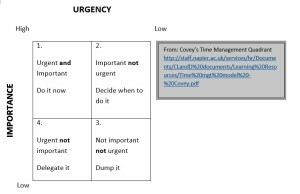 Covey’s view is that quadrant two is the optimum place to “be”. I will let you spend time researching this yourselves as I’m sure most of you have a copy of this book in your libraries or if not, know someone who does. It is definitely worth rereading if it’s been some time since you read it. As promised, here some practical time management tips that work for me. Only you can determine whether they will work for you, so try them out! If you have your own solutions, tips or tricks, please add them to this discussion. Figure out your goals for the year, month and week. Set milestones for each item (what needs to be done, and by when). Build in celebrations (treats for hitting targets). Put these events into your calendar. I have specific things I want to accomplish each week. One is writing this weekly post, so I block “creative time” into my calendar so that I have dedicated time for writing or producing other material. At the beginning of each day make a list of items you want/need to accomplish. Prioritize them, write 1, 2, 3…. beside each. If you don’t get to these items just move them to your next day’s list. Here is an idea I came across many years ago: If you complete a task that was not on your list, add it anyway and then cross it off. I’ll explain why below. A major key to getting things done, is to manage distractions. Distractions happen—we can minimize them and manage them, but never eliminate them altogether. Creating a plan for managing distractions is an important time management skill. The first step is to determine what your major distractions are. Doing so can help you find solutions and manage them. Finally, have you ever had one of those days when you feel like you accomplished nothing at all? Let’s go back to my list-making suggestions above. If you cross off the actions you completed plus add to the list other activities you completed that weren’t on the original list, then at the end of the day you can look back at it and, sure enough you will have a documented record of your accomplishments for the day. I guess I can check off “write my next blog post” now.